MasterCard has been working with chipmakers NXP and Qualcomm on the project and Capital One is the first issuer to take part in the programme. “What we’re doing now is extending the capabilities of our credential management platform to make it extremely easy for all different kinds of device manufacturers across many categories to access secure payment credentials and literally make it possible for any device to be a commerce device,” Sherri Haymond, group head of digital channel engagement at MasterCard, told NFC World. 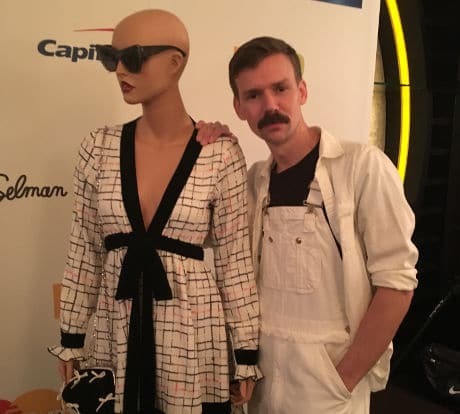 “Adam Selman felt very strongly that we showcased the different possibilities that can happen when a creative mind like his gets married up with a technology platform like ours,” Haymond continued. “What we’re showcasing is a dress where payments can be enabled on the sleeve and also via a bow that ties on the front of the dress. Also, gloves, a handbag and some jewellery, all of which are commerce-enabled. “General Motors is extremely interested in the whole idea of connected car,” Haymond explained. “We think, and General Motors agrees, is that a great first step towards embedding payments into a connected car experience is to first commerce-enable something that is very understandable for consumers, and that is the keyfob. “They plan to embed NFC credentials into their car keyfobs which goes into the ignition and starts the car so when you’re walking around and running errands and you come out of your car, you can use the actual keyfob for payments. “What’s really interesting here is that this leads to the ability to connect the car console, in the future, to the credentials that will be inserted into the car via the keyfob to enable secure remote commerce experiences later on. “We are also working with a really innovative jewellery company, a fashion brand called Ringly,” Haymond added. “They’re on the opposite end of the spectrum from General Motors. They are a very innovative startup company that created a ring that was originally conceived for women to be able to get colour-coded and different kinds of vibration notifications via a ring that you wear on a finger. “All of these things are platform agnostic,” Haymond explained. “They will be able to work with iOS, with Android and with Windows devices. You do the provisioning through a connected device but it’s platform agnostic which is a really interesting thing about all of these devices that we’re enabling. They have the potential to reach many, many consumers, regardless of what their preference is for which phone platform they use. “So, what we’re trying to show is that the possibilities are infinite, they’re endless. With this technology and with the platform capabilities that we’re enabling, virtually any device can be connected to MDES and can securely receive MasterCard credentials and we can MasterCard payments-enable virtually any device. “We believe that mobile payments will continue to be on the rise, except we’re focusing less on mobile and more on secure digital. I guess for us, we’re device agnostic. Some people will find it appropriate at some times to pay with their phone and some people may find it appropriate at different times to pay with jewellery or a keyfob or if they’re wearing a payments-enabled jacket when going for a run.